The more mobile apps come out, the bigger the discovery problem gets for users: Apple, for example, recently announced they have 425,000 apps in the App Store. Rankings, recommendations from platform providers or search often bring unsatisfying results – a pain that an app called AppGrooves [version 2.0, free on iTunes] now tries to solve. There are quite a few recommendation engines out there already (i.e. 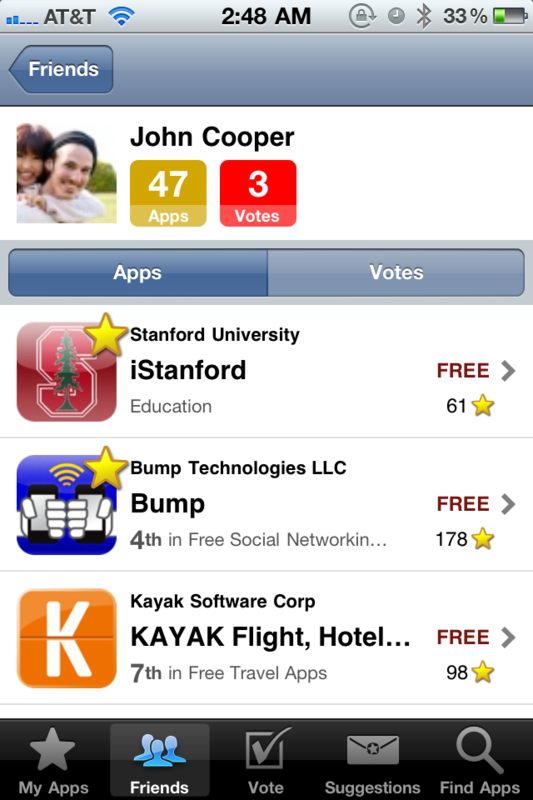 Chomp or Frenzapp), but AppGrooves goes in a different direction: the idea is to combine a proprietary recommendation algorithm with a “Hot or not”-feature and a social element to discover unknown cool iOS apps. The way it works is that AppGrooves first detects what kind of apps you have installed on your device. In order to find new ones that fit your taste, AppGrooves then lets you choose between various pairs of apps it pulls from the list of apps you have on your device in “Hot Or Not” style (i.e. 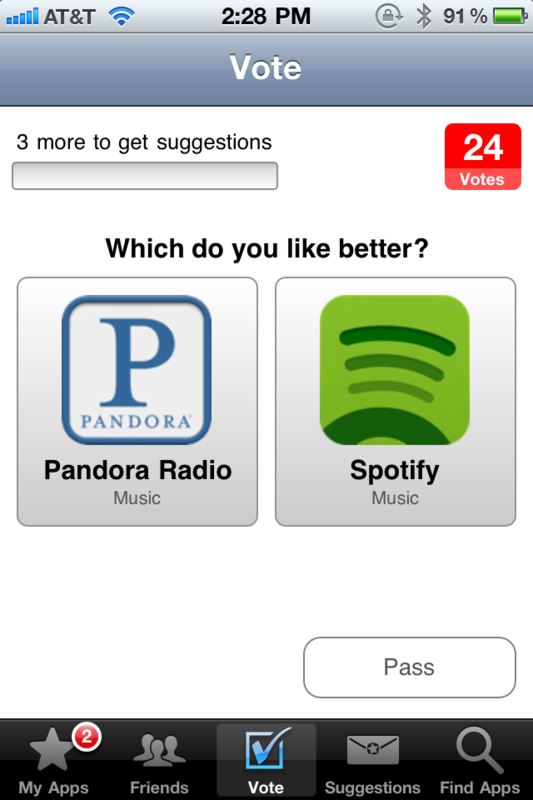 “Which do you like better: Pandora or Spotify?”). 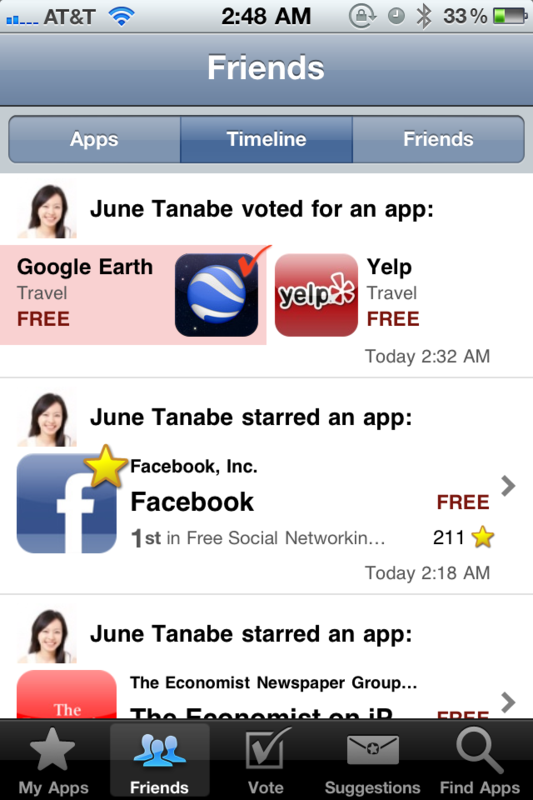 What’s interesting is that AppGrooves allows you to let your Facebook friends vote on apps as well: after voting on a pair of apps, you can not only share your decision but ask your Facebook friends which app they would have chosen for in that specific case, too. 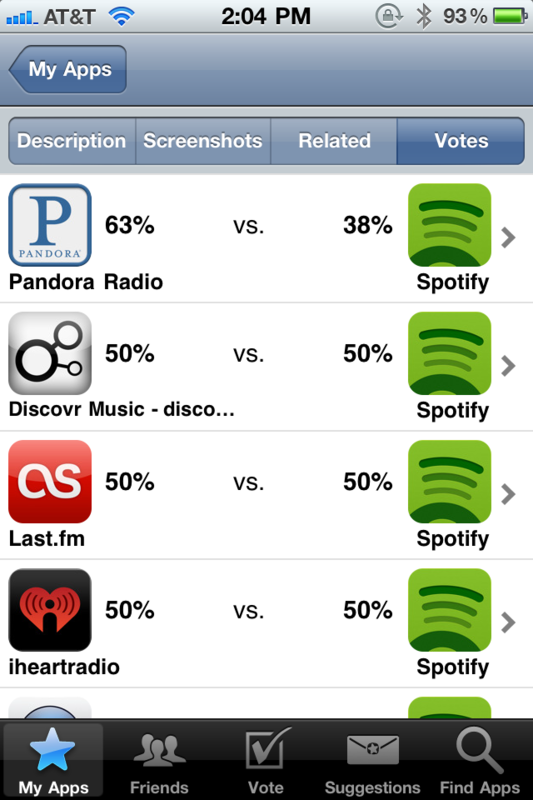 AppGrooves also collects votes from all your friends using the app and accumulates these social votes in order to produce more personalized recommendations over time (you can access this social hit list from within AppGrooves anytime). And if social isn’t your thing, you can also use the app’s search function to find apps with similar descriptions, from similar users etc. AppGrooves is one of the companies of the 500 Startups summer 2011 accelerator program. Its co-founder (and Japanese national) Dr. Naoki Shibata has stepped down from positions at Tokyo University, Stanford University and Japan’s biggest e-commerce company Rakuten to relocate to Silicon Valley. Shibata’s goal was to make his company global from day one, and his plan is apparently working: AppGrooves has just closed $360,000 in an angel round from some big names in the US and Japan, including 500 Startups, Richard Chen (founding partner of AngelPad), Mochio Umeda (president of MUSE Associates), Takao Ozawa and Gen Miyazawa (two Japan-based angel investors).